Fireworks, hot dogs and patriotic music. These are the things that come to mind when most Americans think of the 4th of July. Well, Walt Disney World has all of these things and more, and they want you to know that there is no better place to celebrate Independence Day. If you’re looking for fireworks, of course– as always– you can find them at Walt Disney World. “Illumination: Reflections of Earth” and “Star Wars: A Galactic Spectacular” are showing nightly at Epcot and Disney’s Hollywood Studios respectively. “Rivers of Light” is also showing nightly at Animal Kingdom. These shows will go on at their normal times on July 4. 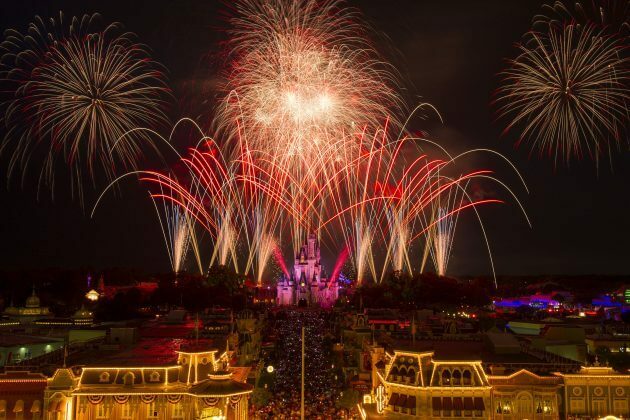 At the Magic Kingdom however, “Happily Ever After” will be temporarily replaced by “Disney’s Celebrate America: A Fourth of July Concert in the Sky” for Monday and Tuesday on both the 3rd and 4th of July. This show will feature choreographed fireworks set to patriotic music and will show at 9:00 P.M. both nights. If you’re looking for hot dogs and all the sides that go with them, Disney’s Grand Floridian Resort and Spa is the place for you. The All American July 4th Cookout will also feature steak, shrimp, specialty drinks, beer and wine. Enjoy this patriotic feast, complete with live entertainment, desserts and a view of the fireworks at the Magic Kingdom. 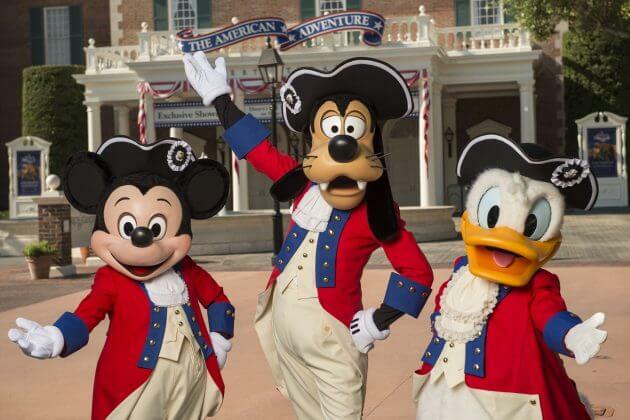 It all starts at 7:00 P.M.
At Epcot, guests will find their favorite characters in patriotic costumes as they celebrate Independence Day in the American Pavillion at World Showcase. In the America Gardens Theatre, guests can enjoy traditional American tunes performed by the a cappella group Voices of Liberty and pop hits performed by American Music Machine, throughout the day. How will you be spending your 4th of July? Let us know in the comments below, and maybe we’ll see you at Walt Disney World! I am surprised Disney is showing anything pro-American, considering they are now the puppets of both the socialist (democrats) and the muslims (changing princess jasmine’s costume so as to not offend). Yay!! Coming over to the US from Ireland next week and we are spending the 3rd July at Epcot and 4th at a waterpark and dinner at Olivia’s cafe. Been to the parks on the fourth of July before never again!! !